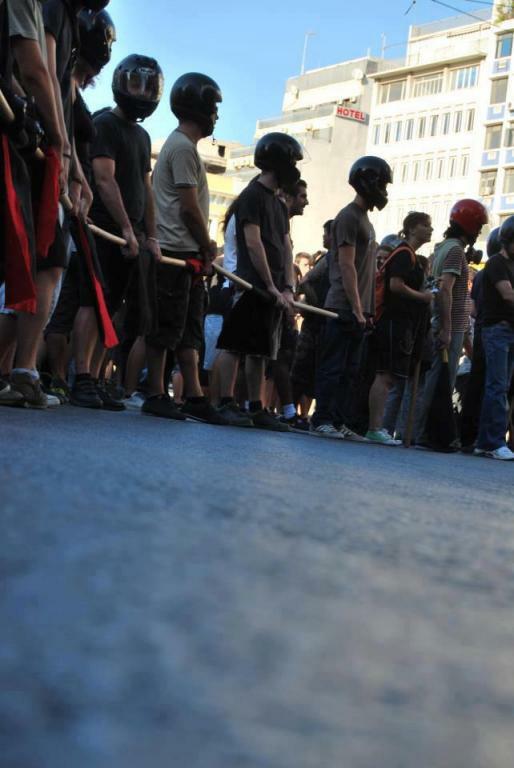 While the Greek government decides on the latest budget cuts strikes and protests return to the streets of Athens. During the last weeks the new coalition government led by the right wing New Democracy party has been preparing a new round of austerity measures. The budget cuts are aimed at savings upto 11.5 billion euros. Officials from the International Monetary Fund(IMF) are in Athens to carry out an inspection of government policy. The Troika(IMF, European Commission and European Central Bank) are demanding more economic reforms reportedly including a six day working week as well as further cuts to pensions. As these measures are discussed and finalised by the government Greece has seen strikes, demonstrations, continuing racist attacks and bomb blasts. With the budget cuts likely to affect pensioners and the public sector the most there has been strike action by municipality workers, transport staff and police staff. Demonstrations by the municipality workers and pensioners were both met with intervention by the riot police(MAT) and the use of chemical agents. Other groups such as teachers and judges also say they will take strike action in the coming weeks. In a continuation of the wave of racist attacks a Bangladeshi man was attacked and stabbed near the centre of Athens. The attack was similar to many others which have been reported recently. There has been at least 500 reported incidents in the last six months. The background to this is the election of Golden Dawn, an extreme nationalist party, to the Greek parliament and the continuing police operation to detain and ultimately deport many immigrants from Greece. Meanwhile Nikos Michaloliakos, the leader of Golden Dawn has promised to send his 'stormtroopers' onto the streets if the party is not respected in parliament. A number of protests against this violence and the policy of the police have taken place around Greece and in different Athenian neighbourhoods throughout the week. A large number of people from the Asian and African communities took part in these protests. In another continuing trend there were two small bomb blasts reported this week. The blasts were made using gas canisters and were directed at a National Bank branch and a police station in Athens. No one has yet claimed responsibility. Similar blasts outside banks and police stations are not uncommon and generally cause minor damage. thanks for this. crazy tho not unsurprising about the stormtroopers.